REMOVE TOXINS SAFELY AND EFFECTIVELY. Positive health outcomes rely on detoxification and healing at the cellular level. This approach gets to the potential root cause of why you are not feeling well. Toxic stressors include biotoxins from mold and Lyme disease, hidden infections, and heavy metals. The TCD program provides three different tests to identify cellular inflammation, biotoxins, levels of toxicity and the effects of heavy metals. These tests are repeated throughout the 90-day program to follow your progress. There are 3 phases over 3 months to finish the TCD program. 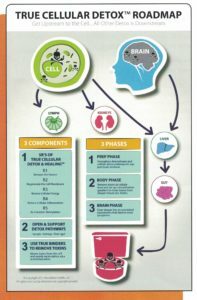 There is a preparatory phase, a body phase and a brain phase. You will have access to an online website that will train you to get the most out of this detoxification program. This valuable information includes a 90-day detoxification meal plan with recipes, a smoothie recipe book, exercise training, advanced strategies for fasting, 8 hours of video training, and 24 educational articles. Need more information for TCD program? Please call (770) 696-4675 and we will be happy to help.